VSWR is a way to measure transmission line imperfections which is generally caused by the impedance mismatch, in this case between BTS output port and antenna connected to it. 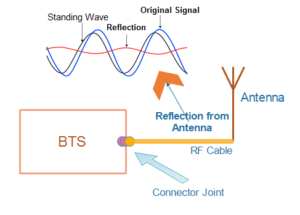 VSWR of BTS Antenna port means that when an Antenna is connected to the BTS output port, then how much power gets reflected back from the Antenna port when BTS is transmitting. 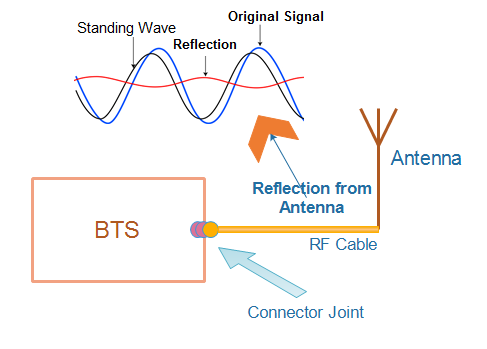 If VSWR value equals to 1, then there is no reflection and all the power is transmitted through the Antenna. When VSWR value equals to infinity, then all the power gets reflected back. No power is transmitted in this case. So VSWR value swings between 1 to infinity. Antenna port Return loss: When you buy an Antenna, then its return loss value is mentioned in the datasheet. If return loss is bad, then VSWR will also be bad. Characteristic impedance of BTS output port transmission line: As we all know, characteristic impedance of RF traces should be 50ohm, if this impedance is not maintained then due to mismatches, reflections take place and so the VSWR gets degraded. Generally, 1:7 VSWR value is considered acceptable. And if VSWR value is above 1:2.5, then it may be a alarming point for a system.